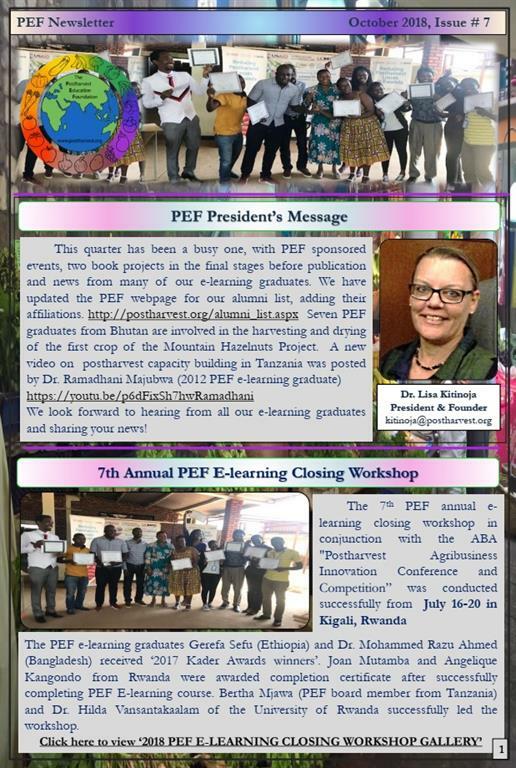 The Postharvest Education Foundation (PEF) is pleased to announce quarterly e-newsletter which will give details of our recent activities and future programs. 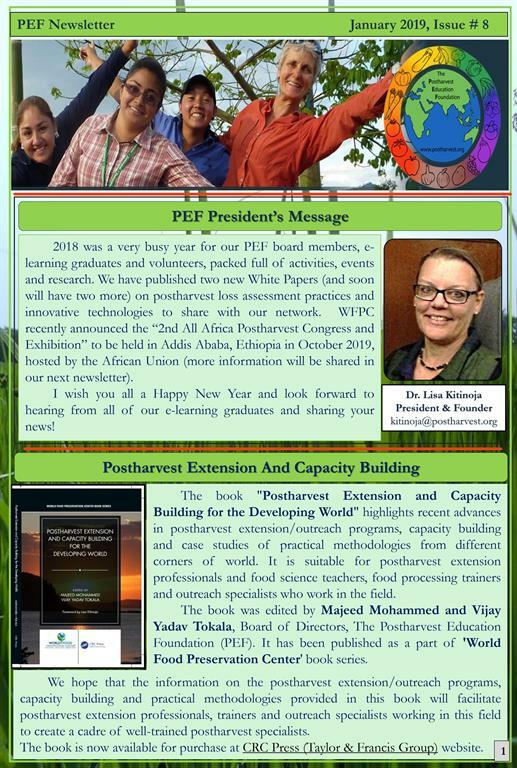 We will be happy to hear any postharvest related updates/information you would like to share through the PEF newsletter. Let us know any suggestions or changes you feel to have in the next issue of the newsletter. 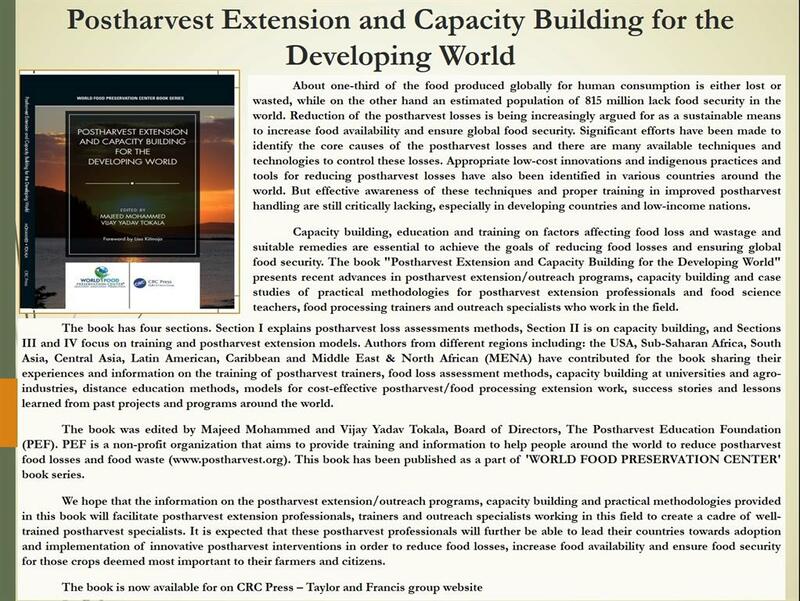 Announcement (10 December 2018): The 2018 winner of the PEF Kader Award in Postharvest Training is Vijay Yadav Tokala! Congratulations Vijay. 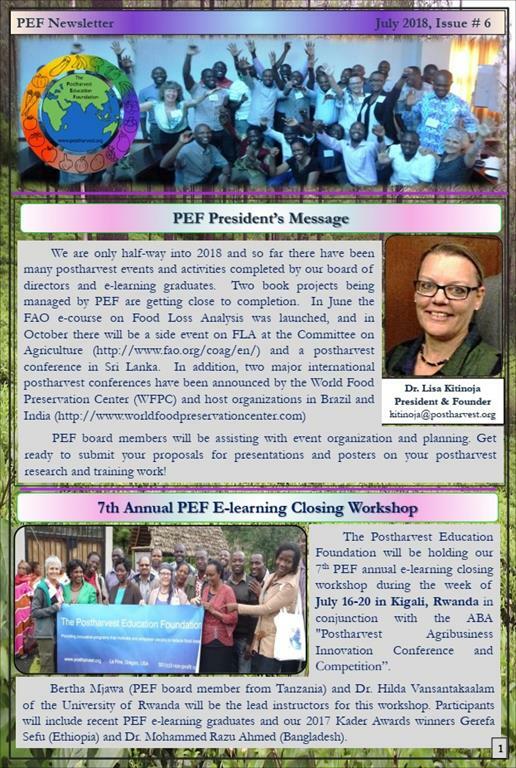 We are pleased to announce new PEF e-newsletter which will give details of our recent activities and future programs. 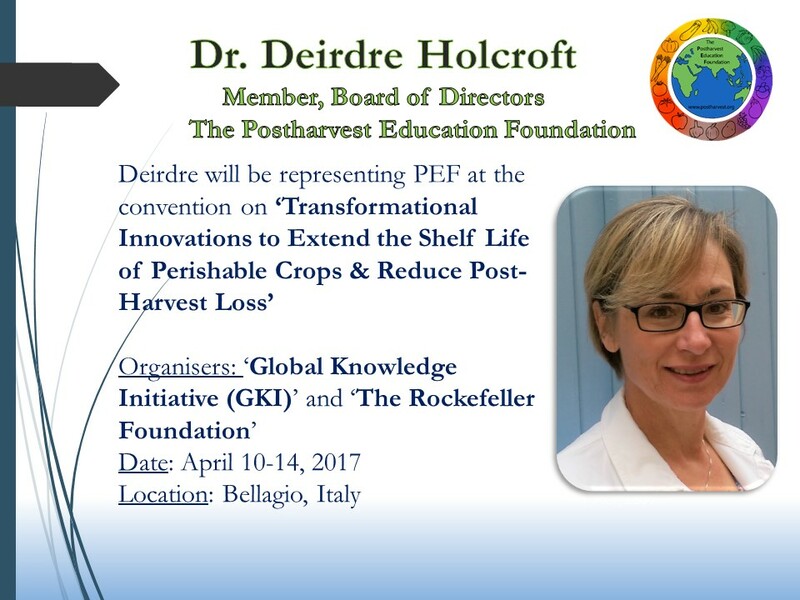 "The First All-Africa Postharvest Congress and Exposition", Nairobi, Kenya (28-31 March 2017) was concluded successfully and it stood as platform to discuss various issues related to postharvest losses and possible solutions in different African nations. 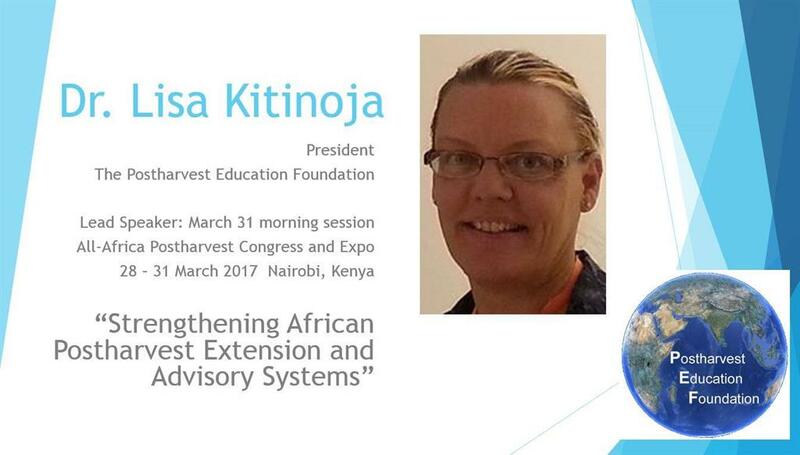 Dr. Lisa gave a keynote address on postharvest education and capacity building in Africa entitled “Strengthening African Postharvest Extension and Advisory Services“. Many PEF e-learning graduates attended and presented their work at the congress. Mohmad Arief Zargar (Kader Award winner for 2016) was a PEF delegate from India, while Mekbib Seife (Ethiopia), Antonio Edoh (Togo) and Herve Ineza (Rwanda) attended as delegates for their respective institutions. 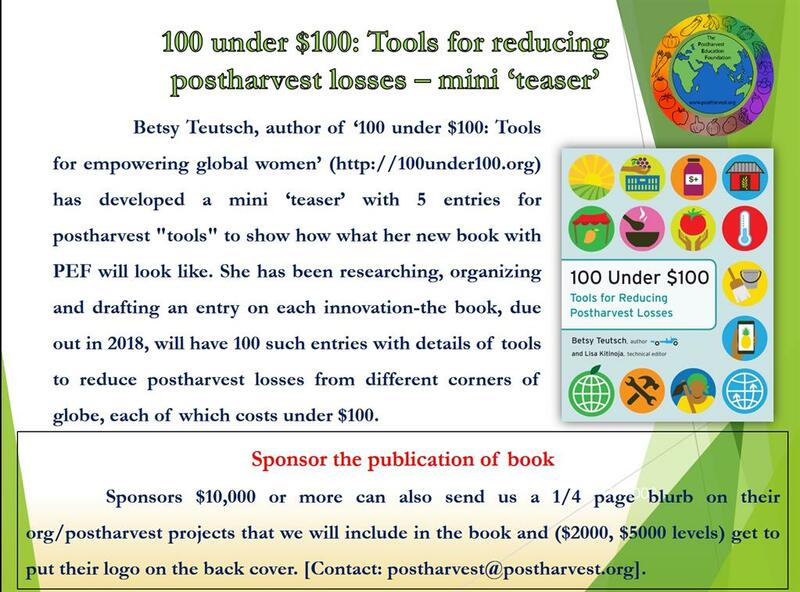 Thanks to ‘ADM Institute for Postharvest Loss Reduction’ for sponsoring two of our PEF board members (Cathy Kitinoja, who presented a poster on “Ramping up Postharvest Training of Trainers in Africa”, and Bertha Mjawa, who was on the winning team in the postharvest innovation competition) and also for travel grant to several of our PEF delegates: Jacinta Naiyika (Malawi), Esa Abiso (Ethiopia) and Dr. Olubukola Odeyemi (Nigeria). "DryCard" won the grand prize in the “All Africa Postharvest Technologies and Innovation Challenge". The low-cost tool, called the DryCardTM is a invention from UC Davis researchers, which shows farmers whether their dried food products are dry enough to store safely to reduce food losses and risks of mold and associated toxins. 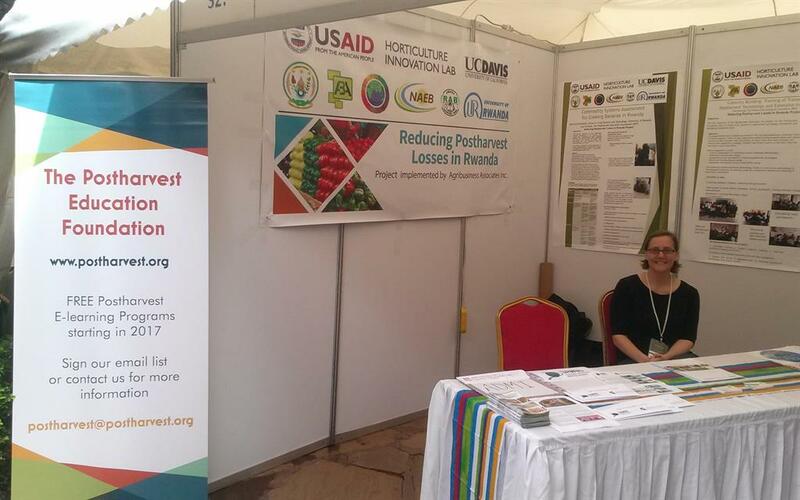 PEF stall at All Africa Postharvest Conference and EXPO, Nairobi, Kenya. Come and check out to know more about our activities and achievements.! 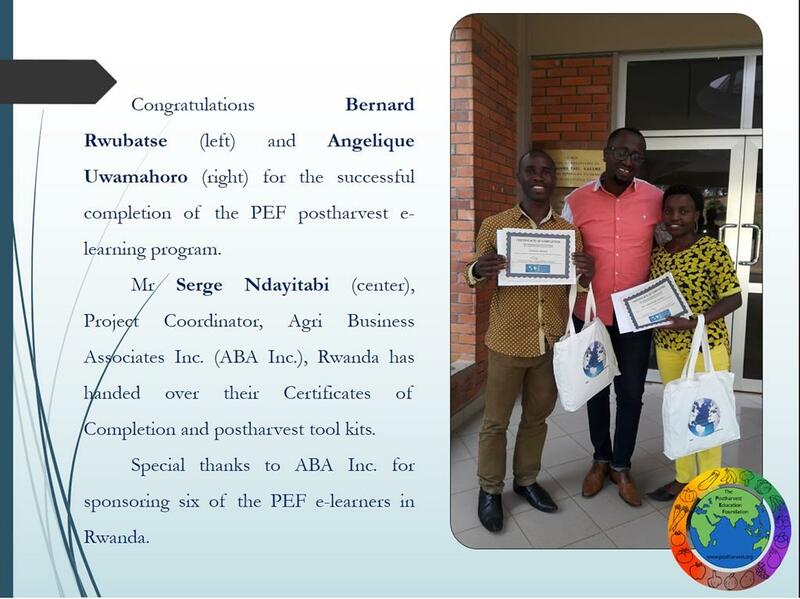 Successfully completed the PEF closing workshop at Kigali, Rwanda. We thank everyone who extended their support to make this successful. 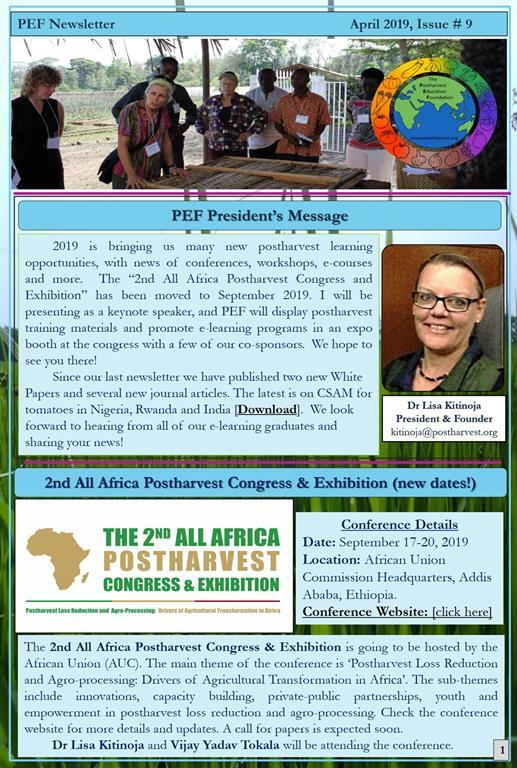 Join us in Kenya for the All-Africa Postharvest Congress!. More than 500 delegates are expected to attend! LK will be speaking and PEF e-learners will be making presentations on their work. Deep condolences to SAMUEL AYUBA HAMISU, Nigeria. Recently we have learned that Samuel passed away on Feb 18 following a short illness. 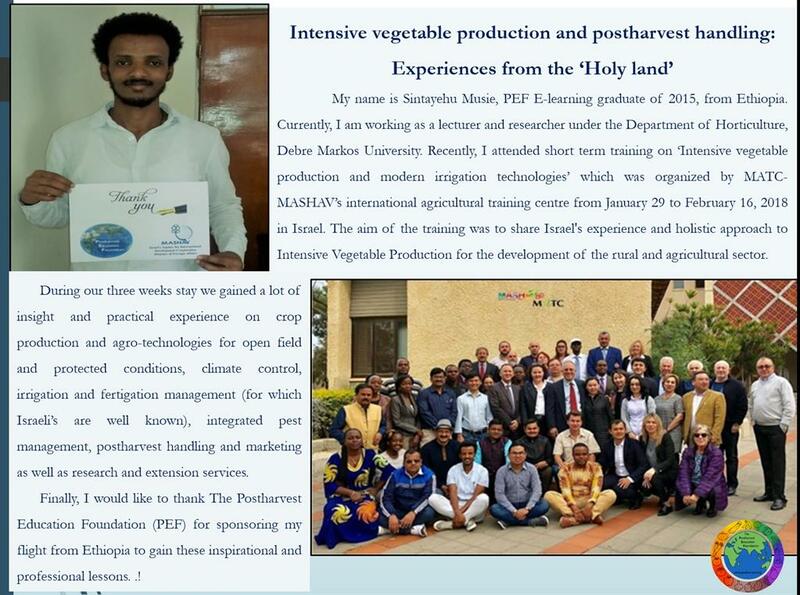 He graduated from our PEF in global e-learning program in 2013 and has been active as a postharvest technology lecturer and through other postharvest activities since that time. It is very sad to know about it and we express our sympathy to his family and close ones on behalf of The Postharvest Education Foundation (PEF). 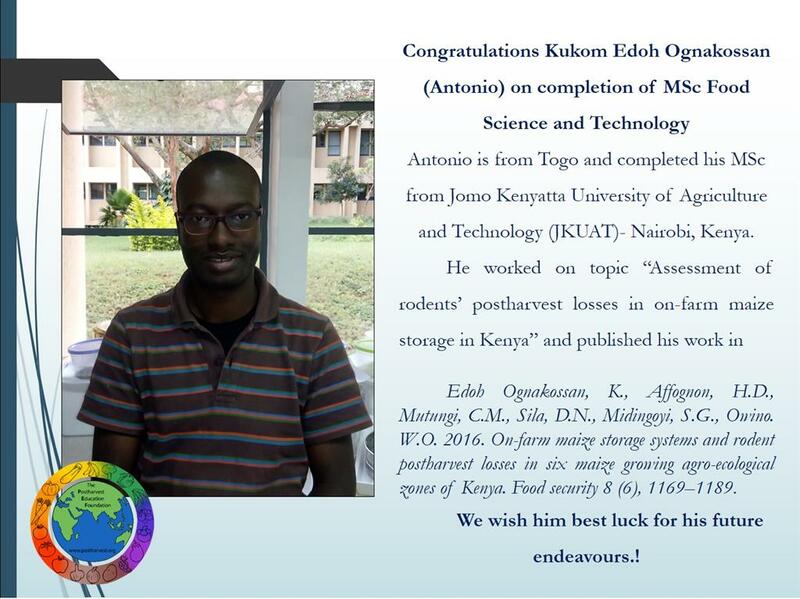 He will be missed and we will remember his earnest efforts to help others in the community and his willingness to share his knowledge on reducing food losses with his students and colleagues. The Organizers of the '1st All Africa Postharvest Congress and Exhibition' (Nairobi, Kenya), which is to be held from 28th to 31st March, 2017, have announced the 'All Africa Postharvest Technologies and Innovations Challenge-2017' with main aim to document and showcase the best emerging postharvest technologies and innovations with potential for scale-up. Additionally the challenge seeks to establish and strengthen linkages between innovators and potential investors to facilitate up-scaling and out-scaling of their innovations with the ultimate goal of reducing postharvest food losses. The call is open to individuals and institutions from or working in Africa. We will update this post when the winners have been selected. ‘Carrier’ successfully organized ‘3rd World Cold Chain Summit’ and brought together some of the leading global supply chain experts to discuss ways to reduce food losses through the strengthened cold chain and to improve coordination. The earlier summit convened 131 delegates from 33 different nations, which included world leaders in private supply chain sector, concerned government officials and academicians to discuss loss in emerging and developed economies. Dr Majeed Mohammed (Board of Director, PEF) represented The Postharvest Education Foundation and presented the topic ‘Gaps in the cold chain in the Caribbean’. Cold chain gaps at different levels of the supply chain were discussed while highlighting the role of PEF in reducing these gaps. Dr. Bertha John Mjawa is mentioned as the drivers for change towards the reduction of food loss, and optimization of agro-food chains to prevent food losses. 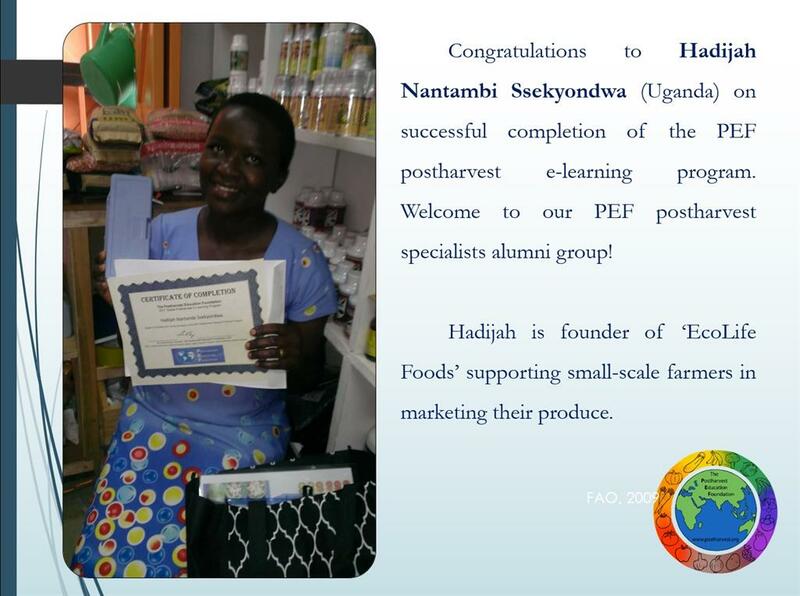 Mjawa’s work has been professionally supported by ‘The Postharvest Education Foundation (Oregon, USA)’, which has enabled support by USAID-funded projects. Ms. Mjawa is known in Tanzania as the crop-saving champion. 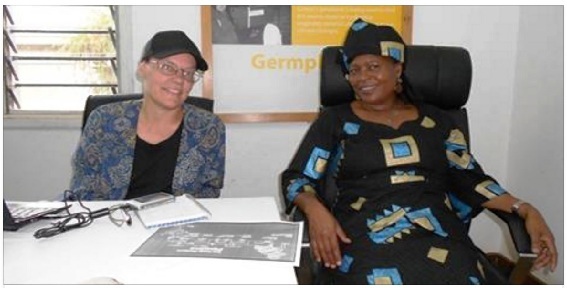 In 1994, she was working as an agricultural field officer for the Tanzanian Ministry of Agriculture. 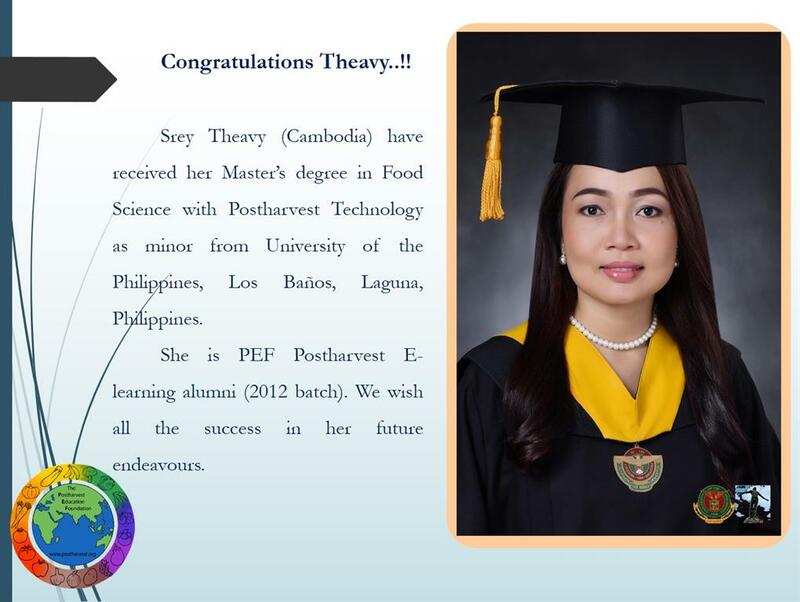 She started her own business, processing commodity crops and training entrepreneurs in food-processing skills. Nowadays, she is an agricultural extension specialist, working with the government on a major value addition and market improvement project called Market Infrastructure, Value Addition and Rural Finance. Mjawa’s goal is to reduce post-harvest food loss throughout Tanzania by creating awareness and training programmes. She has brought her own resources and training to the people who are now doing the work. 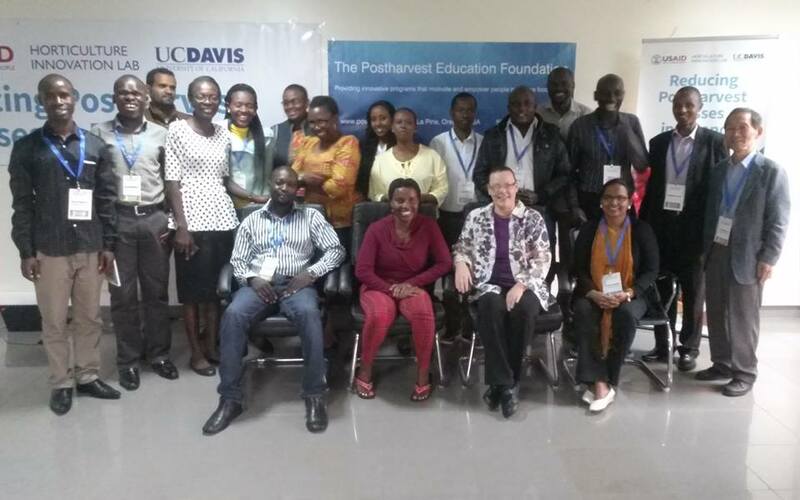 As a result, the pilot Postharvest Training and Services Centre was launched in October 2012, training young horticultural professionals from seven countries (Benin, Ethiopia, Ghana, Kenya, Rwanda, Tanzania, and Uganda) as ‘post-harvest specialists’. Simultaneously, during 2012–2015, three years of mentoring were provided by ‘The Postharvest Education Foundation’ for more than a dozen Tanzanian extension workers and post-harvest trainers who are currently working within the local communities in and around Arusha to improve post-harvest handling practices and reduce losses in horticultural crops. Our deep condolences to Ignace Nzeyimana, Rwanda. 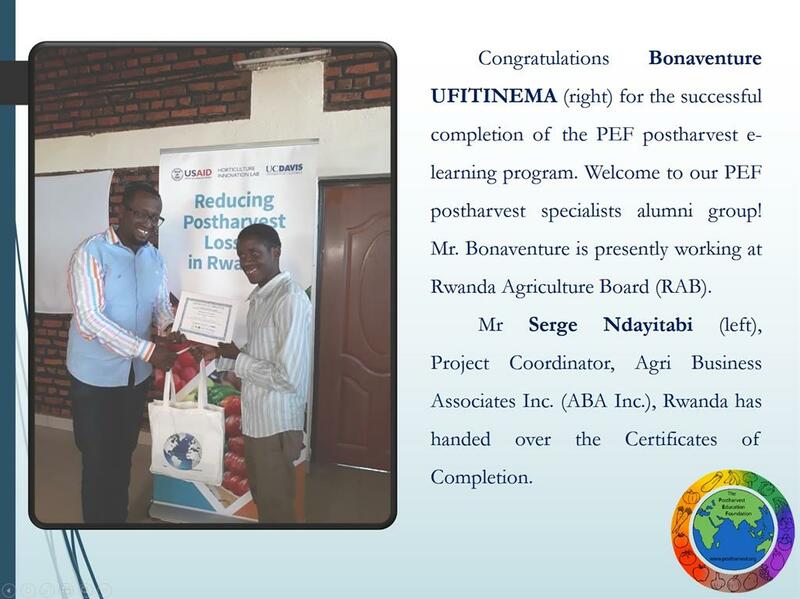 We have recently learned that Ignace Nzeyimana, Rwanda (2012-PEF graduate) has passed away. 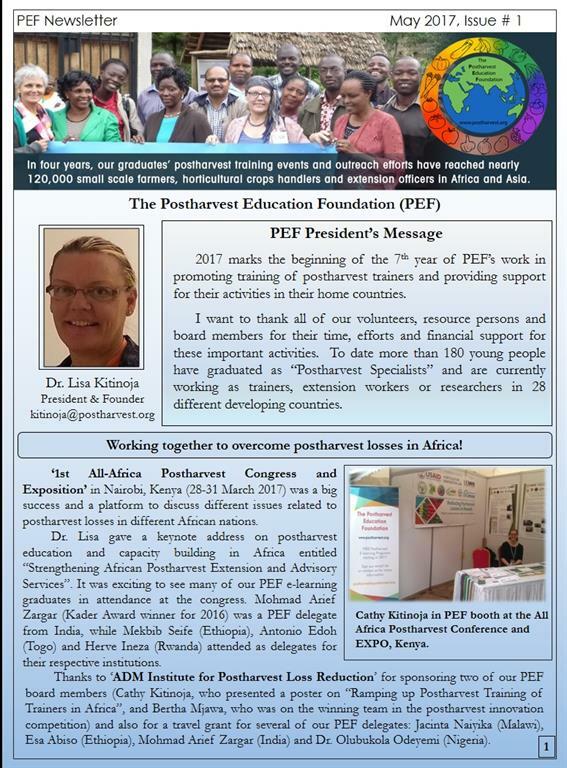 It is very sad to know about it and we express our sympathy to his family and close ones on behalf of The Postharvest Education Foundation (PEF). He has been actively involved in several extension activities to support farmers in Rwanda. We shall wish and pray for the strength to his close ones to overcome this sadness in their life. 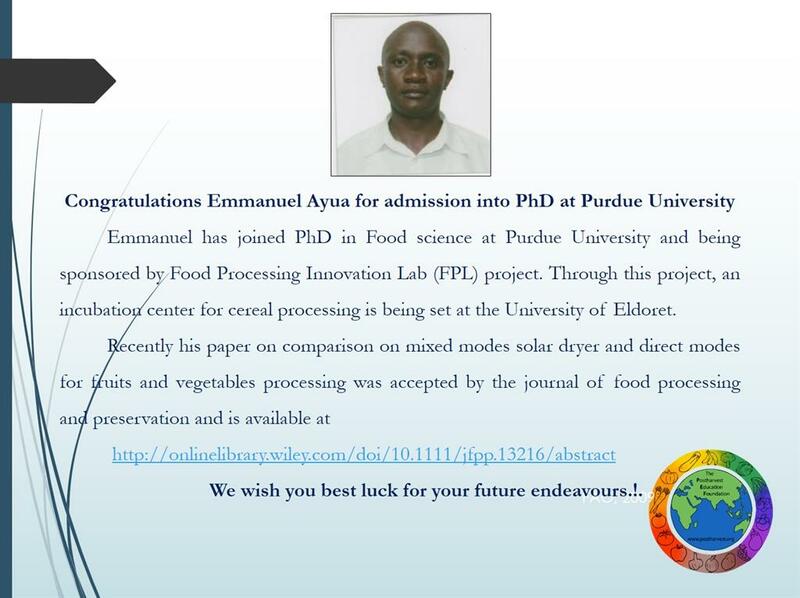 Jacinta Nyaika (2015 PEF Graduate) is awarded 2016 Norman E. Borlaug International Agricultural Science and Technology Fellowship. The Borlaug fellowship promotes food security and economic growth by providing training and collaborative research opportunities to fellows from developing and middle-income countries, building capacity in young scientists through a one to one mentorship program. She has been attached at Iowa State University for 12 weeks and is being mentored by Dr Buddhi Lamsal, Food Science and Human Nutrition Laboratory; Professor Ben Carl, Dept. of Agricultural Engineering and Dr Ajay Nair, Dept. from the Horticulture department. 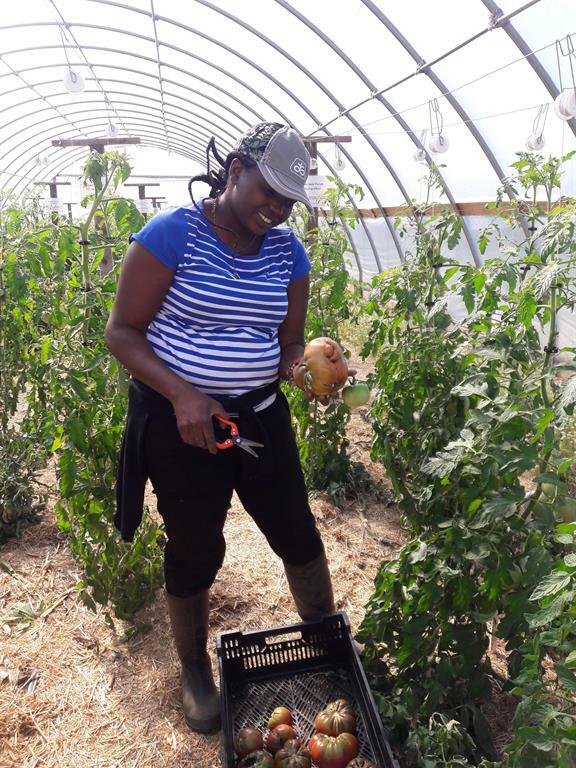 During this program, Jacinta will be working on postharvest handling of tomato research. Specifically, she is working on finding the potential alternative cheap sources of sanitizers for prevention of microbial growth tomato, which is the first most grown vegetable crop in Malawi. She is also working on packaging the quality of tomato and tomato products to enhance their shelf life. 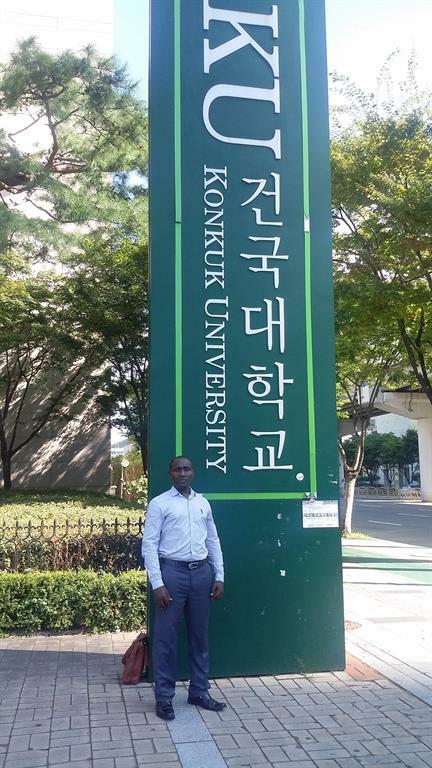 J. Norbert Mugabushaka (2012 PEF Graduate, Rwanda) was awarded of a KOICA Master's degree Scholarship program, for a 2 years study at Konkuk University, Seoul in South Korea. The degree program is entitled "Master's degree in Agricultural Processing and Marketing" with ‘Bio-resource and Food Science’ as major. The scholarship is under cooperation program of KOICA (Korean International Cooperation Agency) and developing countries. 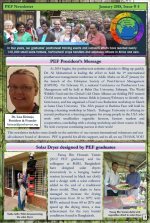 Green is Good Radio interview with Lisa Kitinoja - Listen in as Dr. Lisa describes the beginnings of PEF and our work. PEF included in the Second Annual Good Food Org Guide (2015) Food Tank produced the Good Food Org Guide in partnership with The James Beard Foundation. The Guide includes an online database (www.goodfoodorgguide.com) of 1,400 organizations across all 50 states plus the District of Columbia, working in sustainability, nutrition, and agriculture as well as a mobile mapping system. A committee of more than 100 leading voices in the food movement chooses all organizations in the Guide, and more than 20,000 people have downloaded the Guide in the last year. Improved postharvest practices: A recent research study undertaken by WFLO with funding by the Bill & Melinda Gates Foundation provides an great assortment of data on the results of 12 past projects, postharvest losses % for 26 crops, a description of the value chain for 30 crops in 4 countries (Rwanda, Benin, Ghana and India) and 21 field trials of postharvest technologies suitable for helping small farmers reduce losses and improve their incomes. The original project report is 318 pages long (available for download at http://postharvest.ucdavis.edu/datastorefiles/234-1847.pdf), but you can read a summary here. Reducing Food Losses from Farm to Market, October 2014: An introduction to small-scale appropriate postharvest handling practices, with illustrations and resources for you to use in your own training programs.